Natural roofing slate formed 400 million to 550 million years ago, is a microcrystalline, fine grained metamorphic rock. The color of slate comes from the region’s mineral and chemical composition. The main minerals are quartz/silica, white mica, black mica, chlorite, hematite and carbonates. Chlorite produces green slates. In North America green slate comes from Vermont, New York and Newfoundland. The shades of green will vary depending on the quarry and region. The color/shade may also change as the producer encounters different color layers in the quarry. In Vermont and New York their unfading green slates range from bright green to gray/green tones. In Newfoundland the slates range from blue/green, gray/green or olive to light grey. 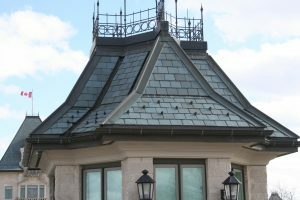 Unfading Green slates are one of the most popular roofing slates. They can be used alone or as one of the blended colors used on a multicolored roof or slate pattern. When architects specify a color, they should understand that producers and distributors may have a trade name for the slate. Typically, an “unfading” slate will be slightly more expensive than a “weathering” slate. 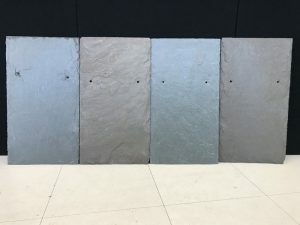 Once you’ve narrowed down your slate color, ask for samples showing the color range to expect in a pallet so there are no surprises when the material arrives at the jobsite. 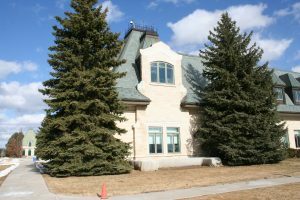 Once you’ve received your slate pallets, an experienced slate roofer will blend and sort the pieces from the various pallets to avoid blotches on the roof. 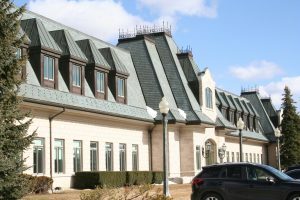 Back in 1996 we supplied 340 squares of the Newfoundland Slate Trinity Green (16” x 8” x ¼”) for the Magna International headquarters in Aurora, Ontario, Canada. The owner, Frank Stronach, designed the building to mirror its European offices in a 400-year-old castle near Vienna. 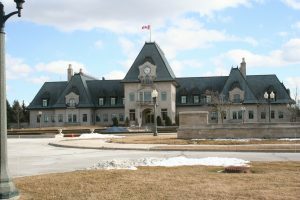 This gorgeous chateau style building is 70,000 square feet! For more information on our slate colors, please call our sales office at Toll Free 1-800-975-2835.